British author George Goodwin will be speaking about the exciting life of Benjamin Franklin on Monday, March 27 at 4:30 p.m. at the Boca Grande Community Center. 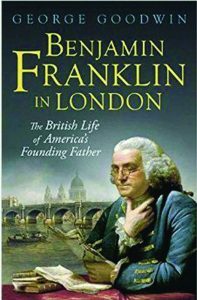 The audience will receive copies of Goodwin’s latest hardcover book Benjamin Franklin in London: The British Life of America’s Founding Founder courtesy of the Friends of Boca Grande Community Center. Tickets are still available by calling 964-0827. The talk is the final in the FOBGCC History & Heritage 2017 lecture series. As Franklin has said, “an investment in knowledge pays the best interest,” hence the series resumes next year. George Goodwin, Honorary Author in Residence at London’s Benjamin Franklin House, is a history graduate of Pembroke College, Cambridge. He is a member of the Royal Society of the Arts, and a 2017 International Fellow at the Robert H. Smith International Center for Jefferson Studies at Monticello, VA. As a historian/author, Goodwin has the rare distinction of being a Fellow of the Chartered Institute of Marketing in the UK. Previous to his writing career, Goodwin was a marketer. Reading the English Ladybird series of children’s history books fired Goodwin’s earliest interest in history. His two previous books are Fatal Colours: Towton 1461, England’s Most Brutal Battle and Fatal Rivalry: Flodden, 1513: Henry VIII and James IV and the Decisive Battle for Renaissance. Contacted in London this week, Goodwin revealed that Benjamin Franklin’s War: London, Paris and America’s Fight for Independence is a project in the works. Born in Boston, Franklin settled at 17 in Philadelphia where he earned renown as a politician and built a printing business that brought him wealth. He traveled three times to London, first at 18 to buy printing equipment, then as a diplomat from Pennsylvania, later representing also Massachusetts, New Jersey and Georgia to King George III. During much of his 26 years in the London, British royalty, scientists and intellectuals embraced him as the most celebrated American in the city. To learn more about the fascinating life of Benjamin Franklin attend the Friends of Boca Grande Community Center program on Monday, March 27 at 4:30 p.m. General admission tickets are available for $35 and reserved seating tickets for $60. Purchase tickets online at friendsofbocagrande.org or call the office at 964-0827. Older PostWe’re down to the wire now … which dog show poster is your favorite?